3. 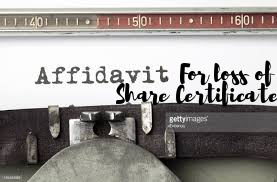 That I/we have not pledged the original certificate by way of security or collateral or otherwise have not sold the above mentioned shares anytime to any person. 4. That the stop transfer instructions given by me/us are not on the grounds of the non-payment by my/our Broker/Sub-broker. 5. That I/we have genuinely lost/misplaced the above mentioned shares. 6. That I/we am/are solely responsible for any future liabilities in respect of the above mentioned securities. I/We solemnly affirm that the statement contained in the above paragraphs are true to the best of my knowledge, information and belief and that nothing material has been concealed from being disclosed. Solemnly declared and affirm on identification at..... on this ...... day of ……. Before the Executive Magistrate or Notary Public.